There's more to living gluten-free than just cutting it out of your diet. This Second Australian Edition of Living Gluten-Free For Dummies helps you embrace a gluten-free lifestyle and make a smooth transition to healthier, tastier living. You'll learn how to decipher food labels, enjoy a balanced diet, cook delicious meals and order at restaurants, deal with the emotional and social aspects of gluten-free living, raise healthy gluten-free kids, and so much more. And best of all, this book includes plenty of great-tasting recipes. 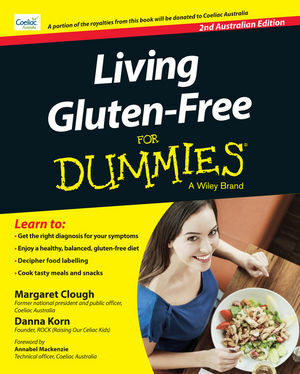 Whether you or a family member have coeliac disease, another kind of gluten intolerance, or want to try living without gluten for other health or nutrition reasons, this Second Australian Edition of Living Gluten-Free For Dummies covers everything you need to know—from great recipes to the latest research and the best ways to manage your health. Margaret Clough is a coeliac and has been actively involved with Coeliac Australia since 1986, serving at times in various capacities, including national president, public officer and travel editor for The Australian Coeliac magazine. Danna Korn is based in the US and has lived gluten-free since 1991. She founded the family support group ROCK (Raising Our Celiac Kids).